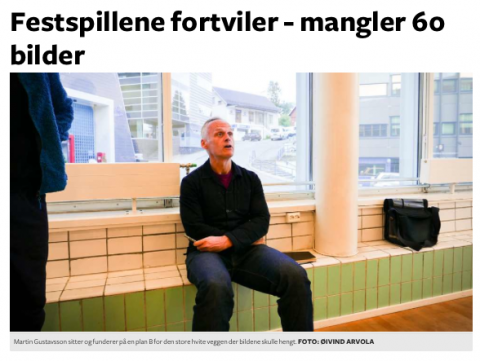 Norwegian newspaper Harstad Tidende reports that the 60 paintings from Martin Gustavsson’s series ‘In No Particular Order’ that were stuck in customs were released in time to be installed for the opening of the Arts Festival of North Norway 2015. ‘Breaking Ground: Story of the London Irish Women’s Centre’ by Michelle Deignan will be screened on Monday 22 June at Cleere’s Theatre, Kilkenny, followed by a Skype Q&A with Michelle and Eilís Ni Chaithnía, Membership Development Officer, NWCI. ‘Breaking Ground,’ part of the touring exhibition ‘Still We Work’ exploring contemporary representations of women and work, captures the evolution of the London Irish Women’s Centre’s dual role as a place for practical support and as a hub for political activism. Made entirely by women, ‘Breaking Ground’ combines unique archive material from London in the 80′s and 90′s with a broad range of interviews with women involved in the organisation over its 29 year history. 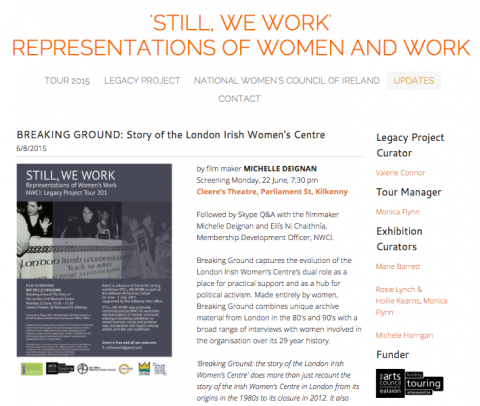 ‘Breaking Ground: the story of the London Irish Women’s Centre’ does more than just recount the story of the Irish Women’s Centre in London from its origins in the 1980s to its closure in 2012. It also contributes to our understanding of radical feminism, national identity and sexual politics during this period.’ Maria-Jose de Esteban, Information Specialist at the British Film Institute, 2013. 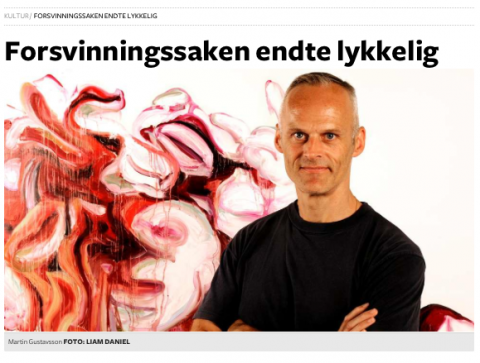 Norwegian newspaper Harstad Tidende reports that 60 paintings from Martin Gustavsson’s series ‘In No Particular Order’ are currently stuck in customs. For the second year running Kamarade will be transforming a house and gardens into a sculpture park. 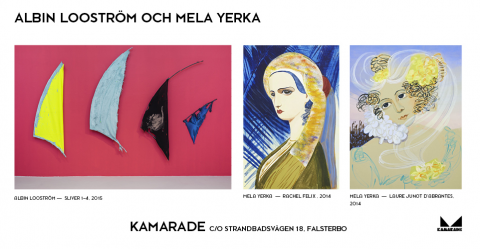 This year will feature the work of Mela Yerka and Albin Looström, in what will be Mela Yerka’s first exhibition in Sweden. Julia Pfeiffer will be participating in group show ‘Wie wir leben (How We Live) at Kunst Haus Wien from 3 September- 18 October 2015. The exhibition assembles concepts of Lebensraum or life habitat: how does life unfold, what is considered a habitat for living, how is it used, built up, protected?